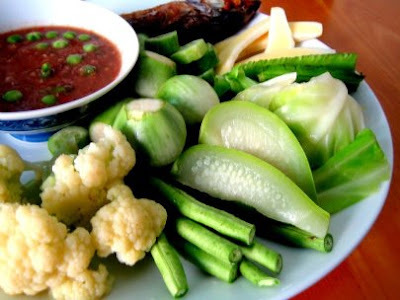 This special relish is one of the most popular relishes in Thailand. You can always find it in any restaurants at every corners of Thailand. The fun bit is there are lots of fresh, fried & steamed vegetables & many more of other things are being accompanied with it. Add Chilies & Garlic in a stone mortar & pestle, pound till almost fine. Then add Shrimp paste, pound till mixed well. Then add mini Eggplants, pound them a little to break some of them . Then add Palm Sugar & Lime juice, pound gently (in circle) to mix well. If its becoming too thick, you can always add a little of water. Taste before serving if more of seasoning (Fish Sauce & more of Palm sugar) is needed. Then remove into a serving cup. 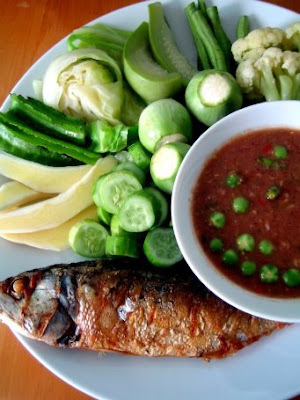 Serve with fried, fresh & steamed Vegetables, Thai Mackerels (as mentioned above.) & steamed Rice. Thank you so much for your blog! I love it!